Glen Billing scored three times in eight minutes for Phantoms against MK Thunder. Forward stars Ales Padelek and Glenn Billing both hit hat-tricks to ensure there was no hint of an NIHL Autumn Cup semi-final hangover for Peterborough Phantoms last night (January 20). The city club eased to a 6-1 success at Milton Keynes Thunder to keep their NIHL Division One South title challenge on track only 48 hours after an agonising penalty shoot-out exit at the semi-final stage of the knockout competition. Ales Padelek scored a hat-trick for Phantoms at MK Thunder. A tough night looked in prospect as Phantoms trailed to a solitary Thunder goal in the opening period, but import Padelek struck at opposite ends of the second session to turn the contest. Only a minute had passed when he equalised and the Czech veteran then fired Phantoms ahead for the first time just seven seconds before the buzzer – and that proved to be a significant strike as Slava Koulikov’s side took command in the closing period. Padelek completed his treble before that fine scoring feat was matched by Billing, who lit the lamp three times in under eight minutes. Billing, who is on a two-way deal with Milton Keynes’ top-level Lightning team, struck twice in powerplay situations before completing the scoring with 89 seconds to go. The 20 year-old’s first goal proved to be a milestone moment in Phantoms’ season as they became the first NIHL Division One South side to reach 100 league goals in the current campaign. They managed it in just their 20th fixture. 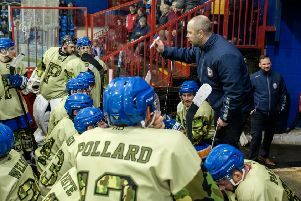 Head coach Koulikov said: “We expected that it might take us a bit of time to get going after the late night on Thursday and not practising on Friday, so we didn’t panic when we were behind at the end of the first period. “Even though we were a bit sloppy at times, we still had 19 shots on goal and knew we could get a result if managing the puck a little better. “We scored goals at good times in the second period to get ourselves ahead. The second goal gave us a huge boost mentally and we were able to follow up with an early goal in the third period as well. “From then on we were able to control the game and take advantage of the penalties MK picked up. “It was the sort of game we should win, but it was important for us coming so soon after the disappointment of going out of a cup on penalties. Phantoms remain level at the NIHL Division One South summit with Basingstoke, who beat fellow title-chasers Swindon 2-1 last night. Phantoms entertain Invicta tonight (January 21, 5.30pm) at Planet Ice.